↑ 1.0 1.1 Reilly, S.B., Bannister, J.L., Best, P.B., Brown, M., Brownell Jr., R.L., Butterworth, D.S., Clapham, P.J., Cooke, J., Donovan, G.P., Urbán, J. & Zerbini, A.N. (2008). 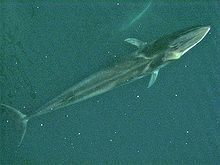 Balaenoptera physalus. In: IUCN 2008. IUCN Red List of Threatened Species. Downloaded on 7 October 2008. หน้านี้แก้ไขล่าสุดเมื่อวันที่ 15 กันยายน 2561 เวลา 21:39 น.